1906, John Cardinal Farley, Archbishop of New York, decided to create a new parish between West 86th Street and 93rd Street to serve the West Side's growing Catholic population. A new subway, the IRT, was transforming the neighborhood. The next year the parish of St. Gregory the Great was established with Father James Fitzsimmons becoming pastor in 1908. The congregation first would meet for services in an old stable on West 89th between Columbus and Amsterdam Avenues, while the priests lived in rented apartments. Christmas services were held in the same building on West 90th Street that parishioners worship in today. That building was designed as a four-story parochial school with the first floor serving as a church until a separate building could be erected. It never was! October 19, 1913, a Sunday, the new building was blessed by Cardinal Farley. Masses began in the parochial school where Sister Louise Mary Mattimore of the Sisters of Charity was principal. The Sisters served the school until 1943, when the Presentation Sisters replaced them. In 1914, the shadow of World War I fell across St. Gregory's. Of the 700 young men from the parish who served in the Armed Services, 28 died. A special requiem mass was celebrated on the nation's first Armistice Day, 1918. After Father Fitzsimmons' death in September 1918, Father William Hughes, president of Cathedral College, became pastor and launched a renovation program. In 1919 Father Hughes converted unused 4th floor space in the school into a rectory. An elevator was installed, as well as a sky-lighted gallery and eventually a library and even a roof garden with a fish pond. During the next 10 years St. Gregory's became well known for its banquets that drew guests from the worlds of culture, scholarship and religion and usually ended on the roof garden. These also were years of intense reaching out to the community. 1922 saw large crowds gathering for pulpit dialogues with non- Catholics. Meanwhile annual missions began in Spanish for the small, scattered Hispanic Catholic population of the Upper West Side. After Father Hughes' death in 1929, Father Patrick O'Donnell served as pastor for 16 years. The 1930s was a time of financial consolidation. Although the physical plant of the church was in good condition, parish debt was almost as large as a decade earlier. Yet despite unemployment and the Great Depression, St. Gregory's managed by 1939 to reduce its debt by 50%. Wartime again made an impact in the 1940s. After peace returned again, the postwar years passed quickly as the parish, like the neighborhood and the nation, prepared for the 20th century's tumultuous second half. Even though the1950s began uneventfully for St. Gregory's, by the end of the decade, changes were occurring that mirrored change in the neighborhood itself. The parish became involved in political and social developments. The number of Catholic parishioners was much the same as in the previous decade, with weekly attendance at Mass slightly higher. The parish school still numbered just over 250 students, but religious instruction for public school children rose dramatically. While a 1959 census showed 2/3rds of those attending Mass bore Irish names, the number of Hispanic parishioners was growing rapidly. 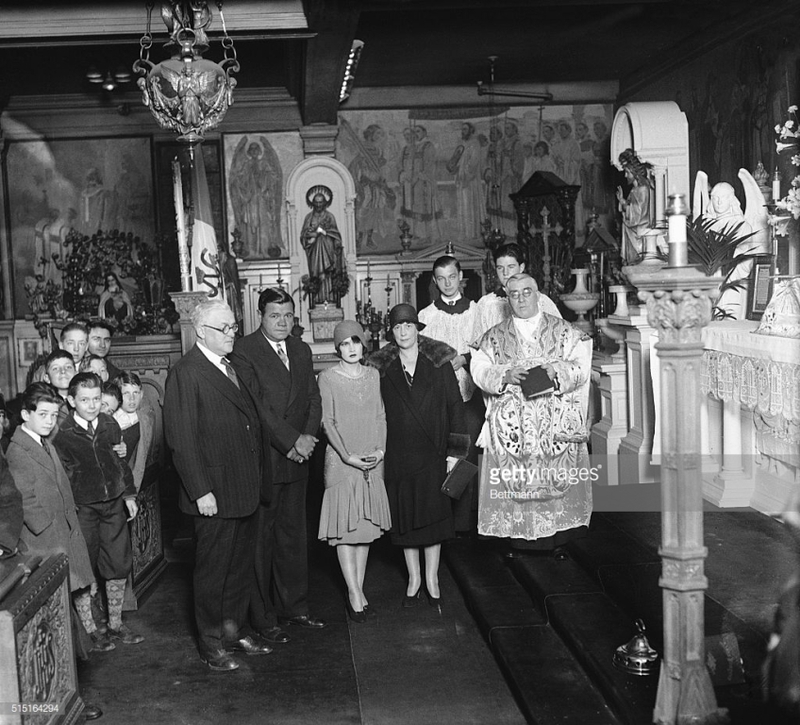 The first Spanish-speaking priest was assigned in 1955, and in 1959 the first Spanish Mass was said in the upper chapel. The 1960s saw St. Gregory's emerge as a powerful voice for affordable housing for the poor. Together with Holy Name Parish and the Strycker's Bay Neighborhood Council, our parish helped convince the city to raise the number of low-cost housing units from 400 to 2,500. In 1963 the first relocation housing opened across the street to provide living quarters for 399 families. Father Henry Browne was a central figure in these efforts. He had been a parish priest at St. Gregory's before assuming the mantle of pastor in 1968. His two-year pastorate may have been brief -- he left to teach at Rutgers University -- but it was dynamic. The activism that led to his presidency of Strycker's Bay grew into his opposition to the Vietnam War. He rallied large numbers of people for local peace vigils, as well as for bus trips to Washington, D. C., to protest the war. During the two years under Father Browne, St. Gregory's also started a folk mass and Good Friday Procession that winds through the neighborhood streets and invites anyone wishing to join in. There were classes for high school equivalency certificates, as well as services and discussion with neighboring Episcopalian, Presbyterian and Greek Orthodox congregations. A new pastor, Father Edward O'Donnell, kept many of these social and educational programs going in the 1970s. In addition, a religious educational program was started in 1971 for 1st through 6th grades. By 1976 the program included 7th and 8th graders and those who were preparing for Confirmation. In 1978 the parish school, that by that time featured 19 different ethnic student backgrounds, marked its 65th anniversary. After more than 10 years of service, Father O'Donnell was succeeded in 1981 by Father John Lennon, who served until 1989. In 1982 our activist pastor was commemorated when 90th Street between Amsterdam and Columbus Avenues was named "Henry Browne Boulevard." St. Gregory's parishioners continued their tradition of social involvement in the 1980s. They took part in marches and rallies for disarmament and affordable housing. The parish inaugurated a Saturday Food Cart on Broadway and 93rd Street. In 1983 St. Gregory's and Holy Name opened a homeless shelter at Holy Name on Amsterdam and 96th Street. Archbishop John Cardinal O'Connor visited our church to bless it on our 75th anniversary. In 1989 Father Raymond Rafferty was appointed pastor of St. Gregory's. In the early 1990s a major effort was mounted to finance and repair the church itself. An even larger effort was saving the parish school. After St. Gregory's had been listed as one of 41 parochial schools that might close, the Parish Council voted to keep the school open and took steps to strengthen its finances. Church officials from other nations were honored at St. Gregory's services in the early 1990s. A commemorative Mass for Cardinal Juan Jesus Posadas Ocampo, the slain Archbishop of Guadalajara, Mexico, was conducted on June 7, 1993. Recently The New York Times reported that a notorious figure in the Mexican drug underworld world had been apprehended and sentenced for silencing the valiant Cardinal, who was thought to be planning to speak out against the barbarous drug situation. On Palm Sunday 1994, a concert in the church dedicated to peace in Bosnia and the Middle East featured Metropolitan Opera soprano Theresa Cincione. And on October 7, 1995, St. Gregory's priests, students and the folk mass chorus took part in a special Papal Mass in Central Park. Father Rafferty celebrated his last mass on June 24th before leaving to become pastor of the Church of Our Savior in The Hague. Father Joseph Darbouze, who hails from Haiti, succeeded him as pastor. Among many other accomplishments, he organized The Parish Profile and History 1907 - 1996. Given his fluency in English, French and Spanish he was especially effective in uniting the parish community. He now continues his service as Pastor Emeritus and comes down from St. Raymond's in the Bronx to celebrate the French mass at 1 o'clock on the first Sunday of the month." With Father Darbouze's retirement in 2006 Msgr. Michael Crimmins took the pulpit. In 2015, The parishes of Saint Gregory’s and Holy Name of Jesus were merged. The name of the new parish became Holy Name of Jesus-Saint Gregory the Great Parish. The St. Gregory the Great building is a four-story structure, designed by Elliott Lynch as a parish school with the church occupying the ground floor. Externally, above the doors are statues of St. Gregory the Great and St. Sylvia. Plans for building a separate church nearby were abandoned during the interwar years and the spartan ornamentation of the school building’s ground floor-turned church was gradually augmented with reused works from churches that had either closed or been remodeled. The charming temporary-turned-permanent appeal includes painted timber wainscoting, a number of mosaic portraits and some substantial stained-glass windows. Groups of angels are clustered in the sanctuary and around the organ, although only one is signed by Louis F. Bernecker. Large canvas paintings of a parade of saints are affixed around the sanctuary, “painted in the late 1920s and 1930s (though none is dated or signed) by Father Gustave de Leon, a priest in the parish between 1921 and 1944…. The choice of saints seems to reflect three influences: the predominance of Irish, French and German ancestry among the parishioners; the interest in those recently canonized or beatified during the time this art work was done (approximately 1920-1945); the gratitude of the parish toward the Order of the Visitation and its affiliate, the Sisters of Charity, who staffed St. Gregory's School until 1943. During the two year pastorate of Father Henry J. Browne, the church increased as a center of activism on behalf of the working class and opposition to the Vietnam war. Bus trips to Washington, D.C., were organized so parishioners could attend peace vigils and anti-war protests. Fr. Browne championed affordable housing and battled a proposed Alexander's department store on Broadway. In April 1970, the anti-war Rev. Philip F. Berrigan, S.S.J., (1923–2002), wanted by the FBI for destroying draft files and failing to surrender for his prison term, arrived at St. Gregory's to address a peace rally. While Berrigan was staying at the rectory, located on the fourth floor of the church, the FBI broke down the church's door to arrest him. Fr. Browne left the same year to take up a teaching position at Rutgers University and in 1982, 90th Street in front of the St. Gregory’s between Amsterdam and Columbus Avenues was dedicated as Henry Browne Boulevard. The baseball legend Babe Ruth (1895-1948) was married in the rectory on April 17, 1929. By 1908 the parish saw church goers starting to worship in a building that had been designed as a four-story parochial school. The first floor would serve as a church as a separate church building was never erected. With high ceilings and comfortably well lit, St. Gregory the Great's break from more traditional ecclesiastical architecture and lighting added to the relaxed and open atmosphere and the ability to appreciate the variety of devotional art. Colorful murals encircle the sanctuary, with a festival of Christian saints lining the wall in back of the altar. Observing Lent and Easter Week at St. Gregory's become a rare personal devotion, for the Stations of the Cross were marked by sculptured tableaux, at eye level, to put you on the Path right behind the Savior. The Stations surrounded the sanctuary for a truly moving meditation. For many parishioners and visitors, however, it was the church's magnificent, turn-of-the-20th-century, stained glass windows, created by Del Prato Studios, that magnetized both as art and channels for Spirit. While a fire destroyed early records, the company--that is still producing--created stained glass art on a par with the renowned Tiffany Studios. "The Last Supper" on the east wall, and "The Miracle of the Loaves and Fishes" on the west caught light through all the seasons, thanks to the large school yard on one side, and unobstructed setting on the other. Smaller stained-glass windows with more Gospel scenes adorn the North wall.